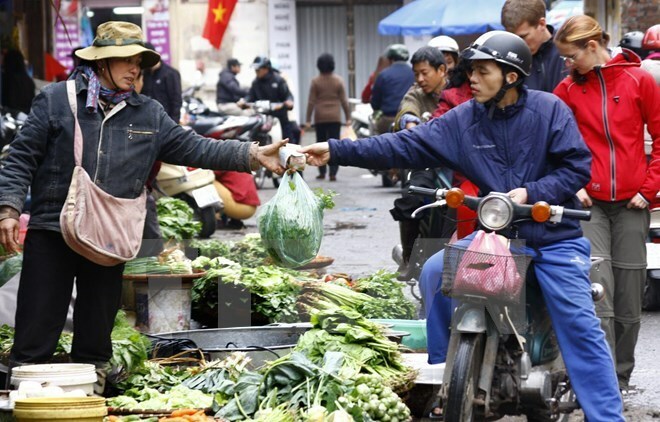 Hanoi (VNA) – The awareness of farmers should receive appropriate attention from authorised agencies as they are important to thoroughly tackling unsafe food, which is now a conundrum in society. Inspections conducted from October 2015 to February 2016 found the residues of banned substances and plant protection products in 5.17 percent of vegetable samples exceeded the permissible level. Meanwhile 15.4 percent of meat samples violated the pathogenic microorganism limits, and 7.27 percent of the examined aquatic products did not meet the standards on chemicals and antibiotics. The data were collected by agencies of the Ministry of Agriculture and Rural Development (MARD) and by 42 of the 63 provinces and cities nationwide. Meanwhile, Secretary of the HCM City Party Committee Dinh La Thang said he does not believe in ministries and sectors’ reports which estimate the rate of unsafe food at 5 – 6 percent since violations are currently at an alarming rate. Many opinions said besides the weak capacity of state management, many farmers are to be blamed when they abuse chemicals and plant protection products in production for profit. Another reason is the uncontrolled trading of chemicals and plant protection products, making it easy for anyone to buy and use them. MARD Minister Cao Duc Phat said Vietnam has millions of small-scale and separate farming households, making the management of agricultural practices impossible. He said farmers should be encouraged to participate in cooperatives so that they will be guided in following VietGAP and GlobalGAP standards. Meanwhile, policies must be fine-tuned to promote the formation of big production chains. In the near future, the MARD will strive to put an end to the use of banned substances in animal husbandry, curb the smuggling of plant protection products, and control the use of antibiotics in livestock farming and aquaculture, the official noted. The Farmers Union has joined the fight against unsafe food, by educating their members about harmful practices and popularising safe food production models in both crop and animal husbandry. Lai Xuan Mon, Chairman of the Vietnam Farmers’ Union, said his organisation’s branches across the country have encouraged local farmers to use microbiological techniques and biological products in agricultural production in recent years. For example, the biological product Biowish, which facilitates the growth of useful biological enzymes and therefore reduces the needed amount of fertilisers, have been put on trial in 38 provinces for more than one year. More than 600 farms raising livestock, aquatic species and crops have reaped higher profits while food safety and environment there are guaranteed, Mon noted.